When talking about jobs of the future, Engineering is often touted as a solid option. Why? 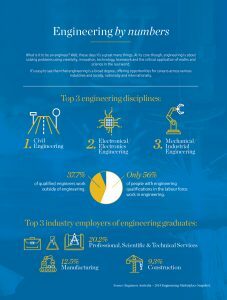 Because it’s broad, it demands creativity and problem-solving and new jobs demanding engineering skills created daily. So, what do you need to do if your child wants to be an engineer? We asked JCU’s Head of Engineering, Daniel Christie. To work in most disciplines of Engineering you need solid maths and science skills. So, when it comes to subject selections, make sure your child knows she/he will need as a minimum entry requirement into an Engineering course, Maths B (mathematical methods) and English. However, to increase her/his chance of acceptance into a course and also give her/him a sold foundational understanding for completing the course, Maths C (Specialist Mathematics), Physics and Chemistry are strongly recommended. When considering universities, keep in mind that JCU, with campuses in both Townsville and Cairns, has a 5-star rating for job success, with 74.9% of JCU graduates finding full-time employment within four months of graduating and JCU graduates ranking number one in Australia for employer satisfaction (compared to graduates from any other university). “For engineering, no significant employer discriminates based on the University attended. All Australian Engineering degrees are accredited through Engineers Australia,” says Daniel. JCU will host Uni Experience days for high school students in coming months. Year 10 Uni Experience: June 3–6. Year 12 Uni Experience: July 15–18.